I have just been awarded my Moodle Course Creator Certificate. Yay! This is the end of three years’ work and I’m delighted. 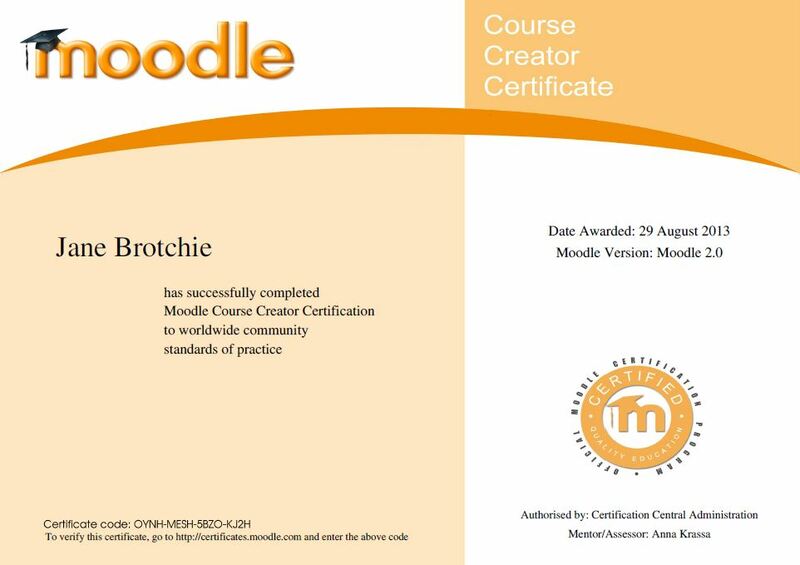 The Moodle Course Creator Certificate (MCCC) demonstrates that you have achieved a standard of practice in using Moodle to create courses. The content of the certification is designed by the Moodle community so it provides a benchmark that is recognised by that community. To achieve the MCCC, applicants must complete a course project, a short narrative document, and an online exam. Each applicant is assigned an MCCC-certified mentor-assessor who is their guide throughout this process. The Moodle Partner I worked with, HRDNZ, organised a separate ‘track’ for MCCC candidates on their MoodleBites for Teachers course, which was equivalent to the course project and narrative. The MCCC is not a training course, it assumes that you already know what you need to know and just want to be assessed and certified. Before I could enrol on the MCCC, I realised I needed to develop my Moodle skills and experience and so, in 2010, I set myself some goals to do just that. I documented this journey in a PebblePad webfolio. For me, the short answer is ‘yes’. I used the MCCC as a goal around which I could structure my work and study. As a freelancer, it is easy to get pulled where the work is and to lose sight of the things that motivate me. I decided I wanted to develop expertise in Moodle and I needed some way of knowing whether I had reached a standard of achievement that would be recognised by other Moodle users. When I was canvassing people’s views about the MCCC, there were some people who suggested this approach is just tick-boxing and that the MCCC does not give an adequate preparation for understanding how to use Moodle. I think this is misplaced. There is an emphasis on the skills and technology but the project and narrative questions could not be passed without an appreciation of how to design courses effectively. In my own case, I thought I needed hands-on experience both designing and facilitating in live courses before I was ready to put myself forward for certification. 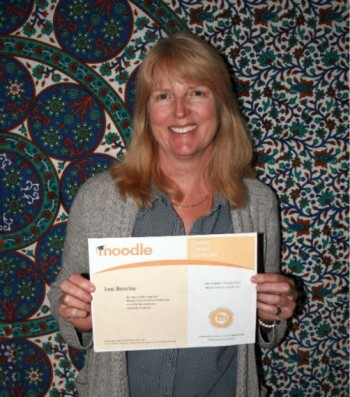 I also found some of my best insights were gained from being a participant on Moodle courses. Understanding what it feels like to be at the receiving end of a good (or bad!) course has had a great impact on how I think about designing a course and I try to keep the user experience in mind throughout. I am not working in Moodle all of the time because I am working on other online learning projects as well. This means I can have breaks when I do not engage with Moodle. Perhaps it’s my advancing age but I have found that I need to apply my learning immediately or I forget it. My next step is to secure some regular work which means I keep my skills up to date. I also need to keep my Moodle networking up as it can be tempting to stick with the tried-and-tested rather than trying out new things. I am now better equipped to develop professional development courses in Moodle. I have gained confidence in creating an environment where people have the best chance of having some enjoyable and creative learning experiences in the company of others with the guidance of skilled and knowledgeable facilitators. Moodle, used effectively, is a wonderful medium to work in to achieve this. Now for the rub. I thought I would feel like an expert by this time. But no, I just realise there is so much more to learn and so many people to learn from. I do not claim to be an expert in Moodle now but I can use it with the intelligence of experience and some knowledge. 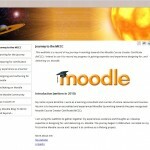 If you would like to start working towards the MCCC but don’t know where to start, it’s not too late to enrol on the free Learn Moodle MOOC (Massive Online Open Course) which is now into the second week at http://learn.moodle.net/. If you have completed the MCCC, I’d love to hear from you. Was it worth the effort for you? Have you used it? Has it helped you develop your skills?